Dealer sentiment remained positive but declined in regards to long-term outlook. Marine dealers’ three- to five-year outlook dropped to its lowest level since June 2016 to 64 out of 100, declining another six points after dipping 11 from 81 in January, according to a new survey. Dealers responding to the survey said potential tariffs on aluminum and aluminum sheet are the most concerning policy issue facing the industry outside of workforce challenges, with the spread of E15 following closely behind. Thirty-seven percent of dealers said tariffs were the biggest concern facing the industry as pontoon sales continue to grow, and 31 percent cited the spread of E15 — fuel with blended with 15 percent ethanol — as the largest challenge. One dealer responded in the comments section of the survey that “fear of ethanol in gas for boats, tariffs and the impact on costs” were all causes for concern. 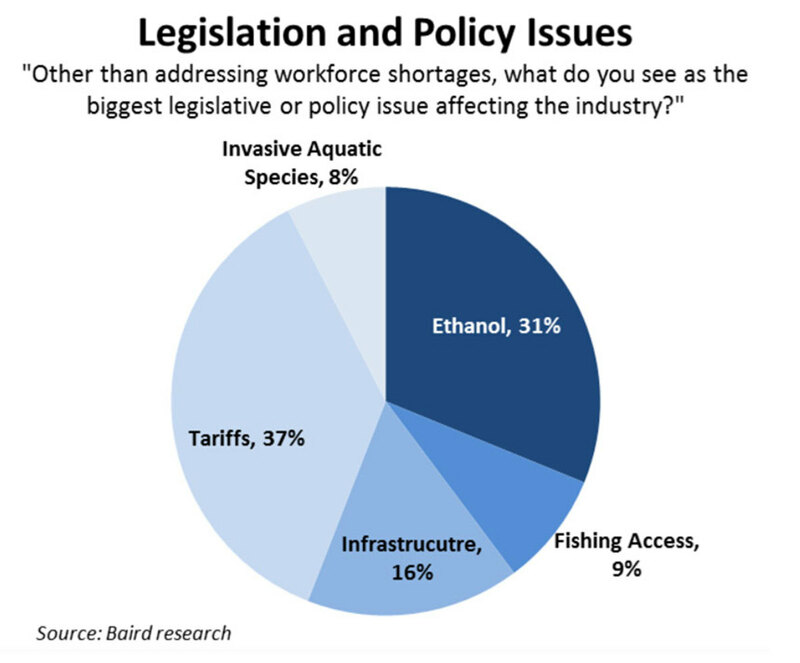 Dealer respondents were more concerned about tariffs and ethanol than infrastructure, invasive aquatic species and fishing access. 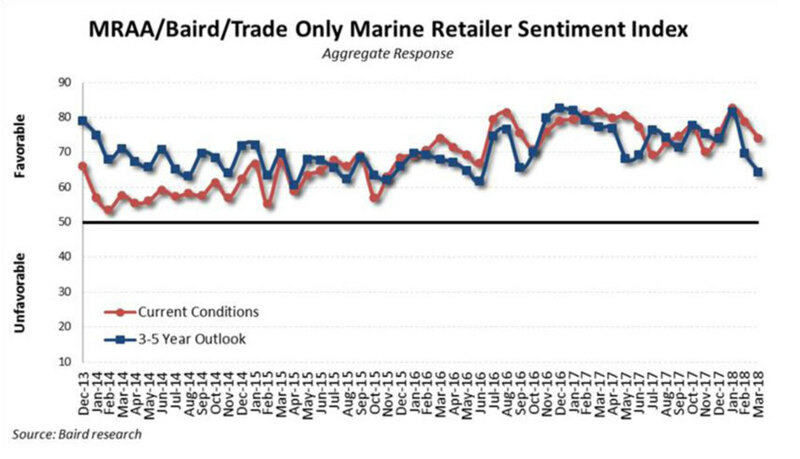 Respondents to the monthly Pulse Report, conducted by Robert W. Baird in conjunction with the Marine Retailers Association of the Americas and Soundings Trade Only, indicated that although marine trends remain strong, dealers are growing more cautious in their long-term outlook. Marine sentiment for the immediate future remains strong at 74, but dipped from 79 in February. Long-term outlook has declined monthly since October 2017 with the exception of January, when it shot up to 81 points, possibly in response to the passage of a sweeping tax reform bill on Dec. 22. For context, the 64 number is still well above a neutral rating of 50. Retailers indicated that the economy, new products, OEM promotions, and access to credit all positively impacted demand during March. Many retailers indicated, however, that lingering cold weather negatively impacted demand, as the Northeast experienced several Nor’easters in March. Also weighing on demand was trade-in activity and government action and inaction — possibly a response to looming aluminum tariffs. "As interest rates rise, it would behoove our industry to think of how we might alleviate high inventory financing costs,” one dealer said. Retailers reported that new-boat inventory levels are appropriate. In March, slightly more dealers considered inventory “too low” (29 percent) compared to “too high” (28 percent). Baird believes inventory remains in the normal range. Several dealers said promotions were working, while others said lack of promotions were hurting sales. One dealer cited momentum from the tax bill as being the most impactful positive influence at his business. Many retailers said pontoons and tow boats were driving positive sales trends, aligning with sales data reflecting growth in those segments. However, a few dealers said fiberglass and large center consoles were soft as more manufacturers enter that segment. New sales tactics were driving growth at least one dealership. “Guerrilla-style marketing at the lake with customers seems to be working well as opposed to waiting for the doors to swing at the dealership,” one dealer said.